My friend Bridget sent me a picture of her three daughters, and they are just so adorable I had to post the picture. 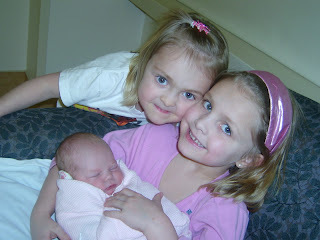 Here's Caroline (baby), Ellie (in white) and Maddy (in pink). Caroline looks so peaceful, Ellie looks so lovingly mischievous and Maddy looks so nurturing. Someday I hope to get out to Iowa to meet them all in person and finally see Bridget after all these years.